If you love surfing internet for specific type of content, then SimilarWeb should find favor with you. 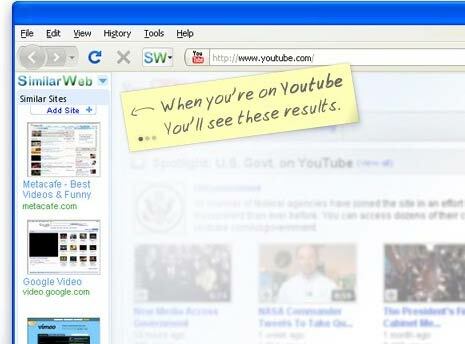 It allows you to discover and surf similar websites. For example: if you are surfing a sports website, it will neatly show websites with similar web content of left sidebar within Internet Explorer or Firefox for easy browsing and exploring. You can see the default mode of thumbnail image display for similar website listing. You can switch to text only list mode, if using slow internet connection. Besides surfing similar content, you can submit your own website to SimilarWeb database for appropriate listing. It also allows you to rank similar web results and share sites you like on Facebook and Twitter.